A bit late with my Doctor Who post this week - that's what happens when you have ALL THE THEATRE to see. Still, here we are with an episode that gets another of the regular BBC One idents given a Doctor Who twist - I liked the Dalek on the roundabout but the TARDIS going underwater with the hippos is a good addition, hopefully over the weeks they'll all get the same treatment. And I guess kudos for not starting with the obvious choice of the Moon rover one. "Listen" by Steven Moffat, directed by Douglas Mackinnon. Spoilers after the cut. Although flawed, this is definitely Steven Moffat using his "timey wimey" plotting device more in the interesting way he did in his first few episodes, rather than the convoluted and irritating way it took over the last couple of series. The plot device introduced twice before in the episode where the TARDIS' psychic controls are easily confused by Clara thinking of someone else really comes around very nicely in the end with the surprise return to the Doctor's childhood, and his words coming full circle. 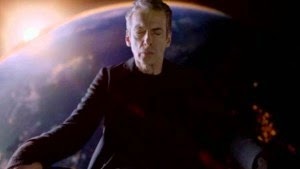 People have said this is the first episode where Peter Capaldi really feels like his own Doctor rather than an amalgam of his predecessors, and I'd agree with that - interesting that one of the things that's becoming a characteristic of Twelve is his being very wrong and refusing to accept it. Although both last week and this, his conviction that something is wrong leads him to solve a problem (the robot invasion last week, Orson trapped at the end of time this week,) albeit by accident. I mean I know he's meant to be awkward, but every encounter she's had with Danny so far has seen him flare up in anger at the tiniest thing. I know it may seem ironic coming from me to say don't just be distracted by his looks but come on, that's not a relationship you want to get into. He's obviously got some major trauma in his past and I'm not saying that means he should never be allowed a relationship, but right now he's got "abusive boyfriend" written in ten-foot high neon letters above his head. Clara's got access to a time machine - if she really wants to continue their date straight away she can jump ahead a couple of years, on the proviso that he spends the time in between in some serious therapy. Or, you know, he ends up travelling with the Doctor in a few episodes' time and gets over his issues by seeing the wonders of the universe. Given this is a family fantasy show, the latter is probably the way they're going to go with this.